If you are ever in a vehicle accident, it can be one of the most frightening moments in your life. The automotive industry has strict safety standards imposed on it by both the government and independent safety organizations, accidents still happen, and people get hurt. Hopefully if you are in an accident, you and everyone involved will walk away without any injuries. Even if everyone is in good health, there are still questions to ask and claims to file. 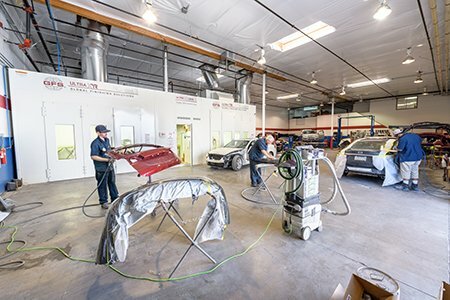 Express Collision Center is experienced in helping you deal with insurance companies to make sure that you get treated fairly and have the option of choosing your own auto repair company. Even though insurance companies have their recommended network of shops, and offer you a referral to their recommend shops, tell them “thanks for the referral, but I want my car repaired at Express Collision Center”. They have worked out a deal with these repair shops to have the repairs done at a discounted price. This is solely so the insurance company will have to pay as little money as possible. Never will you be required by contract or bound by a law to use their preferred repair shops; it is your vehicle, and wherever you decide to take your car for repairs they are obliged by contract and law to pay a fair price to repair your vehicle. If your adjuster is a little to insistent saying that you have to use their recommended repair shops, ask to be shown the contract and the law, and they will be unable to produce anything binding you to their preferred shop. If you feel like your rights have violated, feel free to contact the Nevada Department of Insurance and file a complaint against who ever violated your rights.